Use this interactive home search to view current MLS listings of homes for sale in the Easton Park community. 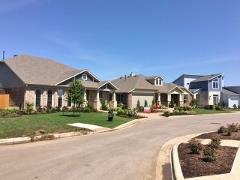 If you find a home that interests you or want a NO Pressure tour of homes in Easton Park, call Jim at 512.913.1557. Neighborhood Location: The Easton Park development is located east of IH-35 in Southeast Austin. Take exit #228 (William Cannon Dr.) off IH-35, then go east from IH-35. 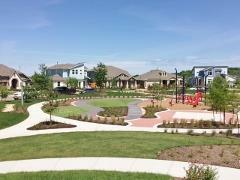 In just over 3 miles you will find the neighborhood at the intersection with McKinney Falls Pkwy. More Easton Park Info: Scroll down the page to learn more about the Easton Park community. Data with the history of Easton Park home sales, sizes and ages will be added yearly. Easton Park Southeast Austin real estate market data from Austin Board of Realtors, 1/1/2016 to 12/31/2018. This Easton Park subdivision is a project of Brookfield Residential, started in 2015. In February 2018, the community has four model homes for the four current builders. 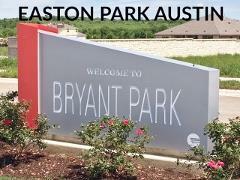 Easton Park is a master-planned development that will cover 1,500 acres in Southeast Austin. When completed in several years, it is slated to have over 5,000 residences (single-family and other). About 10% of the residences will be reserved for affordable housing units. In its future Union Park phase, the development will include retail and commercial offerings and multi-family residences. In February 2018, there are four builders in Easton Park: AVI Homes, Buffington Homes, Sream FInders Homes, and Pacesetter Homes. The original Bryant Park section is complete. Sales in the Knob Hill section are sold out for 3 of the builders, but there is a lot of new construction activity in the neighborhood. Homesites in the neighborhood range from 50' to 70' wide. Base prices start in the mid to upper $280s. The Easton Park development will include 350 acres of pathways, reserved green areas and a number of park/play areas. The first phase includes Bryant Park with its open lawn, pavilion, mailboxes, playscapes, games areas and more. Future phases will include many more features, including a community center, resort pool and water complex, and an olympic-sized lap pool that is planned for completion in the summer of 2018. Easton Park trails for walking and running will cover about 13 miles. The neighborhood is being designed to be friendly for bikers. Other nearby "things to do" and "places to go" the shopping centers along the southern portion of IH-35 (Lowe's, Home Depot, e.g. ), including many near the intersections of Stassney & William Cannon at IH-35. Southpark Meadows features popular large-box stores like a Super WalMart, Target, Sam's and Best Buy, along with eateries, banks, a movie theater, several furniture stores, small businesses, and more. Other shops and places are available south of Austin in Buda (Cabela's) and Kyle, and in areas to the north in Austin. Air travellers can connect to the Austin Bergstrom Intercontental Airport (ABIA) via McKinney Falls Parkway. Major thoroughfares include IH-35 and US-183, which both connect to US-71/US-290. Golfers can "play a round" at courses like these: Grey Rock, Clay and Kizer (City of Austin), Plum Creek (Kyle). 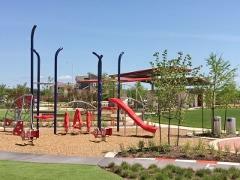 Nearby park facilities include the the Mary Moore Searight Metro Park just off W. Slaughter Ln. and the McKinney Falls State Park (Texas Parks and Wildlife). Owners of homes in Easton Park are required to maintain an active membership in the Easton Park HOA (managed by CCMC). Primary utilities for Easton Park will be provided by Bluebonnet Electric, Centerpoint Gas, and the City of Austin (water). Taxes in Easton Park are assessed by these primary entities: City of Austin, Travis County, Pilot Knob MUD #3 and Del Valle ISD, along with two others. The total tax rate, which will vary from year to year, will be around $3.08/$100 of property value for the year 2017. Students living in Easton Park are assigned to attend schools of the Del Valle School District. Potential Easton Park homeowners should confirm the currently assigned schools with the Del Valle ISD.